In November 2016, a salvage excavation was conducted at Kafr Kanna (Permit No. A-7827; map ref. 231832–65/738870–901; Fig. 1), prior to construction of a private house. 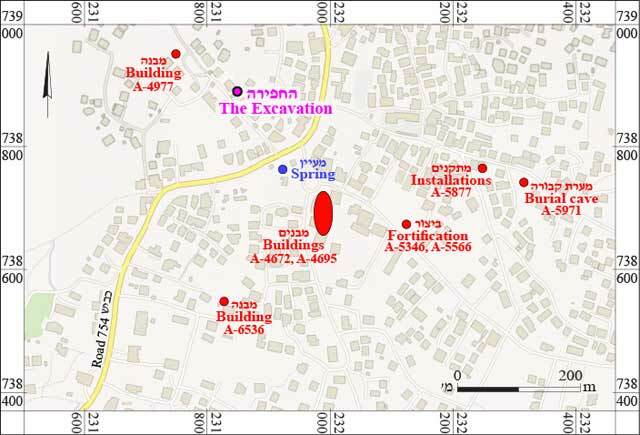 The excavation, on behalf of the Israel Antiquities Authority and partially financed by the owner of the plot, Mr. Amara Wasam, was directed by E.C.M. van den Brink, with the participation of Y. Yaakobi (administration) and R. Mishayev (surveying and drafting). The preliminary inspection, prior to the excavation, was conducted by M. Peleg. The site is located c. 100 m to the northwest of the Kanna Spring. The excavated remains at the site, dating from the Late Chalcolithic and Early Bronze Age IA periods, appear to be a southern extension of a site probed by Y. Alexandre in 2013 (Permit No. A-6723), c. 50 m further to the north. 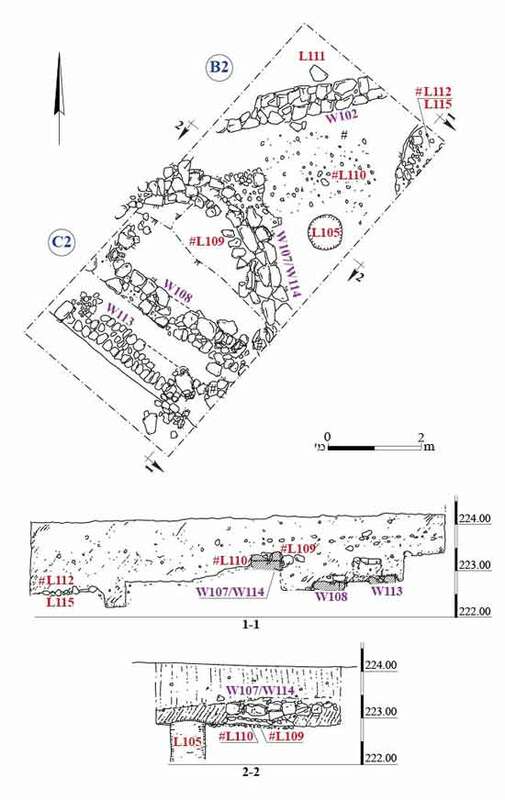 Substantial Late Chalcolithic and EB IA remains were uncovered in numerous excavations carried out in Kafr Kanna, most of them c. 200 m to the southeast of the present excavation (Fig. 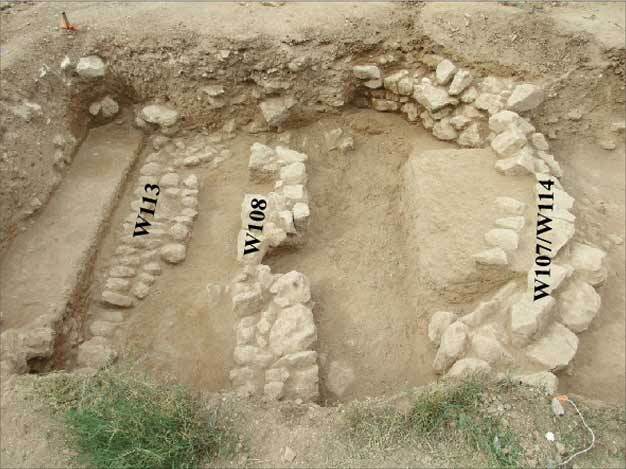 1; for a brief overview of these excavations, see Covello-Paran 2015a; Covello-Paran 2015b). Two adjoining squares (B2, C2; 4 × 4 m; Fig. 2) were opened in the center of the plot, and the mostly sterile topsoil (c. 0.8 m) was mechanically removed down to where a soft, loose, grayish, tell-like soil was noticed along with small concentrations of limestones. Two distinct strata were identified, from the Late Chalcolithic period and the Early Bronze Age IA. The Late Chalcolithic remains, probed only over a small area (c. 2 × 2 m), consisted of a stone surface and an underlying fill; the EB IA stratum evidenced structural remains of at least two, possibly three, separate building phases. A well shaft, possibly from the Ottoman period, cut through the remains from the earlier periods. Although its fill was cleared below the level of the Late Chalcolithic remains unearthed in the excavation, neither natural bedrock nor virgin soil were reached within the well shaft. Ottoman(?) period. A rather recent vertical shaft (L105; Fig. 2: Section 2–2; Fig. 3), most likely an Ottoman-period well, cut through the earlier remains in the southeast corner of Sq B2. It had been back-filled with yellow sand and limestones; these were removed to a depth of c. 1.6 m, without reaching the bottom of the shaft. In the section created by the shaft walls, concentrations of small stones could be discerned at least 1 m below the deepest level reached in the excavation, suggesting that the natural bedrock or virgin soil lie even deeper. Early Bronze Age IA. The EB IA remains comprise segments of stone-built foundations of four, partially superimposed, distinct buildings belonging to two or three building phases (Figs. 2–5). The two upper phases could be firmly dated by the pottery to the EB IA; the remains of the lowest phase date either to the Late Chalcolithic or to the EB IA. The uppermost, latest segment is a large, curvilinear wall (W107/W114)—the northeastern end of an apsidal, probably oval, building. The rest of this structure, including its two parallel, rectilinear long walls lie well beyond the boundaries of the excavation. 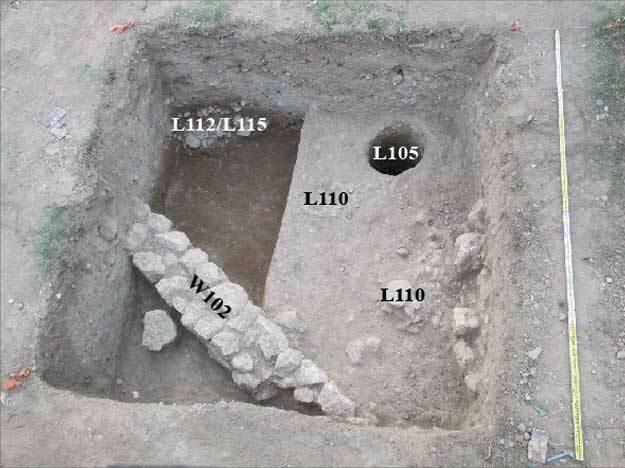 A few in situ remains of a stone slab pavement and two flat stones, most likely pillar bases, were exposed in the interior of this building (L109). Such buildings are typical of the EB IA, and are well-known at other sites from this period, including in the Galilee, such as Yiftah’el, Stratum 2. A similar and larger curvilinear structure was uncovered in 2013 c. 50 m to the north of the present excavation. Wall 107/114 partially rested on a floor foundation consisting of small limestones (L110; Fig. 4). This foundation is directly associated with a straight wall segment (W102) that, along with another straight wall segment (W108), belonged to an earlier building phase. The dissimilar orientation of the two walls clearly indicate that they belonged to two separate, albeit contemporary, buildings. In the southern part of Sq C2, on a slightly deeper level, a fourth straight wall segment (W113) was uncovered; unlike the other walls, it was built of relatively small limestones. The base of the wall could not be reached, and therefore its date could not be ascertained. 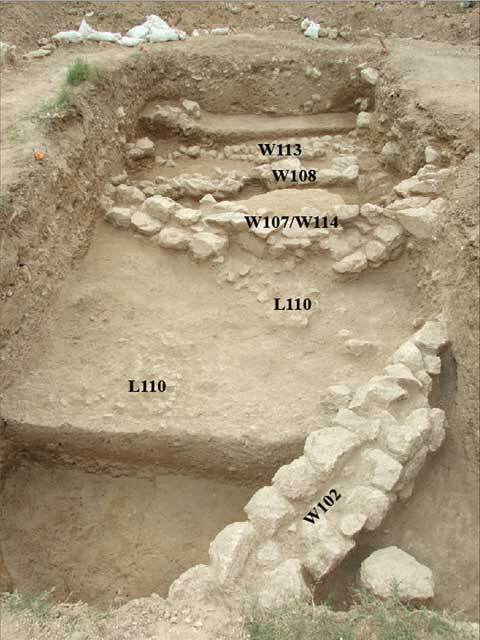 Furthermore, although pottery from surrounding fills seem to date this wall segment to the EB IA, a Late Chalcolithic date cannot be excluded in light of the nearby in situ remains of this date and the different building style of W113. Late Chalcolithic Period. Protruding from the northeast corner of Sq B2, at the deepest level reached in the excavation (c. 0.4 m below the foundation level of W107/W114) was a stony surface (L112; Fig. 3). The pottery and flint items found on the surface and in the fill below it (L115), point to a date in the Late Chalcolithic period. All excavated sediments were dry-sieved through 5 and 10 mm meshes; the finds—derived mainly from fills—comprise mostly of pottery, followed by flint items and animal bones. The EB IA pottery diagnostics include many large pithoi, some partially restorable, with externally applied, indented clay coils (‘rope-decoration’) around the shoulder and further down the body; numerous carinated, knobbed bowls with flaring rims of the Gray Burnished Ware category; and small bowls with incurved rims. The Late Chalcolithic pottery includes mostly small, ‘V-shape’ bowls, medium-sized jars and a single fragment of a fenestrated pedestal bowl; cornets and churns are absent from this admittedly very small ceramic assemblage. A further examination of the pottery and flint assemblages from both periods will shed light on the chronological gap between the two major occupation phases at the site. Only very few sites in the country exhibit a spatially continuous, vertical stratigraphic build-up from the Late Chalcolithic to the Early Bronze Age IA. The site of this excavation, along with the nearby 2013 probe, are therefore a welcome addition to the archaeological records of this transitional period, irrespective of the as yet to be established length (or brevity) of the time gap separating the remains of the two periods. Covello-Paran K. 2015a. Kafr Kanna (A). HA-ESI 127. Covello-Paran K. 2015b. Kafr Kanna (B). HA-ESI 127. 3. Square B2, looking southeast. 4. General view at the end of the excavation, looking southwest. 5. General view at the end of the excavation, looking northwest.